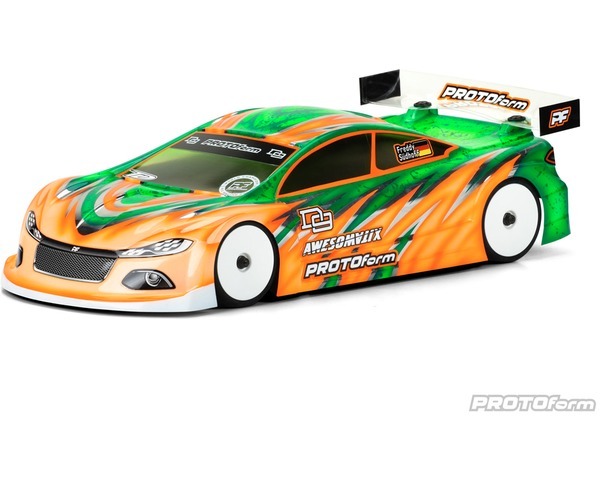 D9 is PROTOforms new aero option for 190mm electric touring car racing. After much success with the Type-S, our world-class team of drivers requested a less-aggressive body handling feel in specific conditions where traction roll was being combated, or in super low grip when utmost rear traction was needed. The critical tuning aid of body positioning is once again made easier with our Mounting Marks inside the front wheel arches. Positions for 0, +2mm, +4mm and +6mm are scribed in for your convenience. Included with every D9 are the all-new rear wing mounts with top button and bottom nut. The D9 is Global Body Spec compliant and fully EFRA (#4062) & ROAR approved. Made in the USA from our high-quality, super-durable polycarbonate, it is available in light weight, PRO-lite and X-Lite weight versions. Included are a PROTOform decal sheet, window masks, overspray film and wing mounting hardware.